What is the Cervical Disc? The cervical disc is a contained structure. On the outside, the walls of the annulus are the outer boarders of the disc. These walls are made out of collagen, the strong but flexible material that is somewhat like the burlap or nylon of a coat. The inside of the disc is made up of the nucleus, a jelly like substance that is under pressure. The entire disc can be thought of as a car tire filled with jelly. Normally the disc wall is quite strong but pliant enough to absorb shock and allow some motion including rotation, lateral bending and even some shifting called translation or shear. The disc can unfortunately degenerate enough to produce neck pain. This pain is generated by the tears in the disc wall (the annulus). Disc pain can also be generated by the bony endplate if the disc becomes degenerative enough to allow impact forces to overstress this area, isolated disc resorption or IDR will occur. 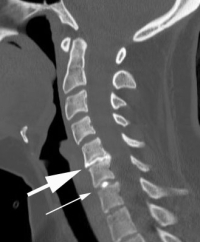 Diagnosing the origin of this pain is sometimes very easy if the patient has typical neck pain and that pain is associated with only one degenerative disc found in the neck. However, with multiple degenerative cervical discs present, the diagnosis becomes more difficult. If the neck pain is significant and the patient has failed other conservative treatments, surgery may need to be contemplated. What is a Cervical Discogram? This is where the discogram is useful. The discogram can identify the pain generator or generators. It must be noted that this is a pre-surgical test and should not be utilized unless a surgical plan can be contemplated. The test is quite simple. A needle is introduced into the middle of the disc at the center of the nucleus. X-ray dye is then injected into the disc center to increase the interior pressure. The skill of the discographer is paramount to the accuracy of the test and the comfort of the patient. Before the first needle is placed, a fast acting pharmacological agent should be employed to significantly sedate the patient. A fully sedated patient will not feel the needles being introduced. This is similar to the insertion of an intravenous line (IV). The discomfort occurs with initial “poke” through the skin but once the line has been placed, there is no discomfort at the site of insertion. Once the needles are placed, the patient then needs to be awakened, conscious and capable of answering questions rationally. The discographer needs to be patient to await the subject recovering from this fast acting anesthetic agent to be rational enough to critically answer questions. Three sets of data are generated. First data points are the opening and maximum pressures of the disc. Opening pressure is the initial pressure that the dye flows into the disc. The maximum pressure is endpoint of the dye flow. These pressures tell us about the integrity of the disc. A disc that has a large tear might be so incompetent that it cannot hold any pressure and maximum pressure generated is low. The second set of data points are the volume of dye and dye pattern that is generated within the disc. A normal disc is similar to a stiff water balloon. It will admit only a small amount of dye and the dye will stay within the center of this disc. If there is a tear in the disc, this dye will leak out along the tear. If the tear goes through and through the wall of the disc, the dye will exit out along the tear into the adjacent structures. The most important data point is pain generation. The patient may still be slightly sedated but needs to be awake and able to report the quality and intensity of pain. As the disc is pressurized, a positive test will reproduce the typical pain this patient experiences on a day-to-day basis. This is called “concordant pain”. Pain is graded on a one to ten visual analog scale. Pain can also be patient-rated as non-concordant. This is pain that occurs with pressurization but is not identifiable as the typical day-to-day pain. A normal disc should cause no pain but possibly the patient will note a slight “pressure” sensation. Some discographers always want a “normal” (non-painful) disc to be included to make sure the patient has no pain processing problems. There are circumstances that would make a tested normal disc valuable but many circumstances this is not required (in my opinion). It bears repeating that this test depends upon the skill of the individual who is performing the test. Various factors can lead to false information. The needle placed into the annulus and not into the center of the nucleus will always cause pain, even in a normal disc. The patient needs to be awake and capable of answering questions. A patient that is not fully awake cannot give appropriate answers. Also, rushing patient answers and not repeating pressurization multiple times to confirm answers can lead to false information. (Click to Enlarge Image) Front to back discogram. Large arrow points to degenerative disc with irregular boarders. Smaller arrow points to normal disc. (Click to Enlarge Image) Side view discogram. Large arrow points to degerative disc and small arrow points to normal disc. (Click to Enlarge Image) Normal top-down cervical discogram. Black arrow demonstrates the dye pattern staying within the normal boarders of the disc wall (annulus). (Click to Enlarge Image) Abnormal top-down cervical discogram. Black arrow demonstrates the dye pattern expanding beyound the normal boarders of the disc wall (annulus) and extending into the spinal canal.